CLOSED / GIVEAWAY! 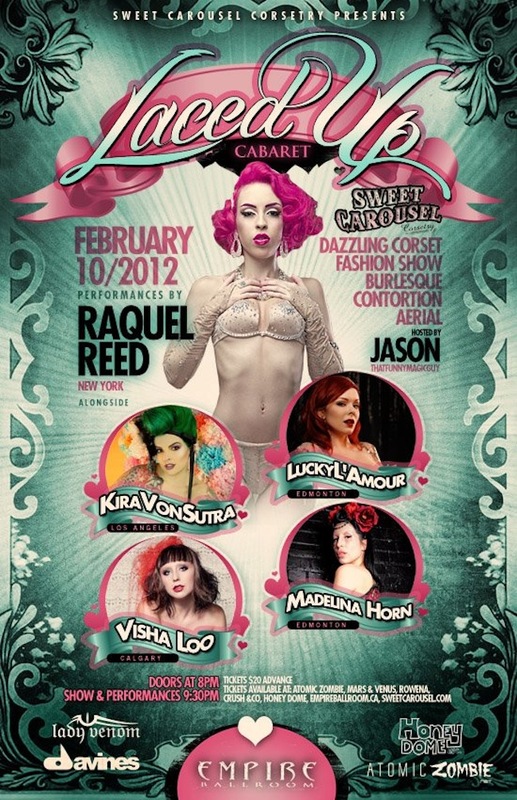 Win 2 Tix to Laced Up Cabaret! Edmonton's Sweet Carousel Corsetry presents, Laced Up Cabaret! One lucky Dress Me Dearly reader can win two tickets to this fun, fashionable night of burlesque, magic, contortion, aerial acts and fashion! The night will be packed with burlesque and carnival-inspired goodness including a Sweet Carousel Corsetry fashion show featuring Canada's Next Top Model runner-up Linsay Willier. And some of my favourite masters of tease, the ladies of Capital City Burlesque will perform! 3. Leave a comment below on this post including your email address. Contest closes Monday, February 6, 2012 at midnight. Winner will be drawn at random. Contest is for two tickets. Tickets can be picked up by the winner at the event. Good Luck! I would love to go to this event! I have never been to a fashion show or a burlesque show, to see the two in one would be wonderful and so much fun! I would be so appreciative if I was the chosen winner! This looks sweet, too bad I have to be elsewhere on this date! Got your msg on my blog! I would love to enter... but I actually like in NY! Moving back to Edmonton in May. I'll get in on the next give-a-way! Darn! I would love to go to this!!! Her corsets are SPECTACULAR! and my name is Steph!! Oh my word I would love to be there sporting one of my many divine corsets she has crafted. such a cool event! I would love to go! I even shared it on facebook!